The muscles that comprise the hamstring work in unison to bend the knee. Hamstring strain occurs when the group of three muscles located at the back of the thigh experience a trauma that may occur during participation in sports. The condition frequently occurs in any type of physical activity in which the muscles in the back of the thigh become overextended. In some cases, the muscles even rupture and tear. The muscles that comprise the hamstring work in unison to bend the knee. They also help with hip extensions which are the movement of the hip and thigh toward the back of the body. These muscles emit from a bone located on the bottom portion of the pelvis, called the ischial tuberosity, and run down the back of the thigh. The biceps femoris attaches on the outside part of the leg. The other two muscles, known as the semitendinosus and the semimembranosus, fasten on the shinbone and on the inside of the knee. What are symptoms of a hamstring strain? The particular symptoms manifested by hamstring strain depend upon the severity of the strain. Mild cases produce a manageable but uncomfortable strain. However, severe strain of the hamstring muscles may be excruciating, rendering its victims unable to stand or walk. During exercise, one might experience a sudden, severe pain that is accompanied by a snapping sensation. Other times, people feel pain along the back of their thighs and lower buttock when they bend over or straighten their legs. Tenderness and black and blue bruising, tightness and spasm can accompany the injury. What are the causes of hamstring strain? Athletes that participate in any sports that involve rapid acceleration activities are at a relatively high risk for a hamstring strain. This includes track, football, soccer and certain types of dance. Any physical activity that involves sudden jerking or lunging movements can also result in hamstring strain and related sports injuries. Sometimes teens that are experiencing sudden growth spurts will also experience hamstring strain as part of their normal growth cycle. Often, individuals that neglect to stretch properly prior to engaging in exercise will also sustain hamstring strain. 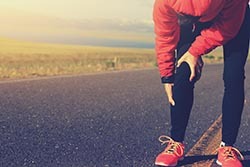 The injury can also occur when individuals develop stronger quadriceps (the muscles in the front part of the thigh) that end up pulling on the hamstring during normal activities such as walking. Patients experiencing hamstring strain often report hearing a popping sound at the moment the injury occurs. What is the treatment for a hamstring strain? If you suffer from a hamstring strain sports medicine may be a great option for natural pain relief. Our sports medicine doctor, Dr. Bob Meyer, has 21+ years of experience treating sports injuries and patients with chronic pain. He has a large arsenal of sports injury treatment methods that can help you find relief from your injury.